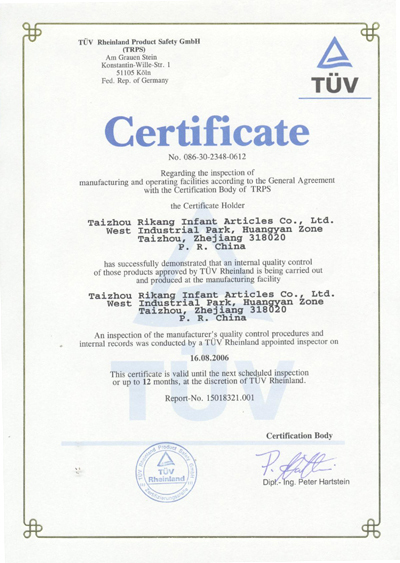 Company Overview - Zhejiang Rikang Baby Products Co., Ltd.
13YRSZhejiang Rikang Baby Products Co., Ltd.
Taizhou City Rikang Baby Products Co., Ltd. is a manufacturer of Rikang brand baby items. All our products are made of high quality raw materials by world-leading equipment. Our main products include feeder series, knit goods series and assistant series. After years of development, our company has become a professional manufacturer of baby products by introducing advanced technology, packaging machinery and inspection equipment. Moreover, we have practiced technicians, product managers, designers, and company managers. We have a strict quality management system to control all the steps from new item development, raw material purchasing and production to packaging. Our products are qualified under the inspection of National Sanitation Department.What we do is to meet babies' requirements and help mothers to better take care baby's growth. Quality control procedures and internal records.